James Caan rightly considers the diner scene his greatest performance. Ahh yeah I saw this in college, but I forgot how terrific it is. Tangerine Dream did the soundtrack, which is good if you like that TD thing. In regards to Tangerine Dream, I thought that the opening bit had aged pretty badly, and how much better it would have sounded if they had used real strings. God, but this is great film. I watched Drive a few weeks back, and having told my dad about how good it was, he kind of scoffed and said "yeah, but have you seen Thief?" Despite loving plenty of Mann's other films, I hadn't. I have now. There's a great triple bill to be had if you fancy this, To Live And Die In LA and Drive. Throw in Walter Hill's The Driver and you have a brilliant quartet of LA underbelly noir. I discovered the Chicago's Green Mill Lounge thanks to Thief, and was relieved to find out that they didn't really blow it up. I was giddy as hell to visit "the Thief bar" when I was finally old enough. That movie was a fave of mine when it came out while I was in high school. It made me start buying Tangerine Dream albums and renting as many James Caan movies as I could find. The first time I saw this, I do not think that I used a contraction in my speech for about two weeks. I love this film SO MUCH. It is an underappreciated gem. There's a great triple bill to be had if you fancy this, To Live And Die In LA and Drive. Throw in Walter Hill's The Driver and you have a brilliant quartet of LA underbelly noir. Thank you, sir. I was seriously thinking of posting an ask mefi: I just watched To Live And Die In LA and Drive and they were better than anything I've seen in years. What do I need to see now? My first impression was that geez, Vincent Gallo cribbed heavily from this scene/film when constructing the Billy Brown character (Buffalo 66). So, Gallo seems a bit less original now, yet Billy still has a place in my (cold?) heart.. I hope you've been keeping your pistol clean, dawn is fast approaching. I keep telling people that Drive is almost a remake of Thief--very similar cinematography, laconic professional criminal with a particular skill set, flawed sidekick, beautiful love interest who is open-hearted despite abuse, a child at issue, a heist with consequences, some brutal violence, and, well, I don't want to give away the rest. The performances are very similar to me. I keep telling people this, but why does no one want to listen to a film pedant? When I was in the Peace Corps in Guatemala, there was a video store in the nearest largeish town to my pueblito. They had a few English-speaking titles there, and Thief was one of the only ones that did not feature Dolph Lundgren, Wesley Snipes, Rutger Hauer, or Tom Berenger (I'm not talking about the good movies those guys made). I rented it and watched it over and over on my laptop, including the director's commentary--highly recommended. A deeply thought-out movie, and very affecting. Yes, Drive is awesome too. Actually I think it's impossible to overstate how great a movie drive is. And the comparisons to thief are apt (even the soundtrack is kind of similar!). So, it doesn't seem that there's anything beyond the first 9:43 on YouTube, it's not on NetFlix, and there's aren't any torrents. Any ideas for seeing the whole film other than calling around to video stores that are still in business? Well, there are some copies on Amazon for USD 11.99. There is one torrent, but it only has one seeder...so yeah not a way popular film with the kiddiez. Burhanistan: So, it doesn't seem that there's anything beyond the first 9:43 on YouTube, it's not on NetFlix, and there's aren't any torrents. Any ideas for seeing the whole film other than calling around to video stores that are still in business? Another worthy movie starring James Caan, from even further back, is The Gambler. Oh, right. Purchasing. Well, that would be novel. For the record, my favorite Caan performance is not Thief but The Gambler; second would be Way of the Gun. You are learned in the ways of Caan. I have found what appear to be working rapidshare links. It may just be me, but I'm seeing something of a resemblance here. Not that this is a bad thing. 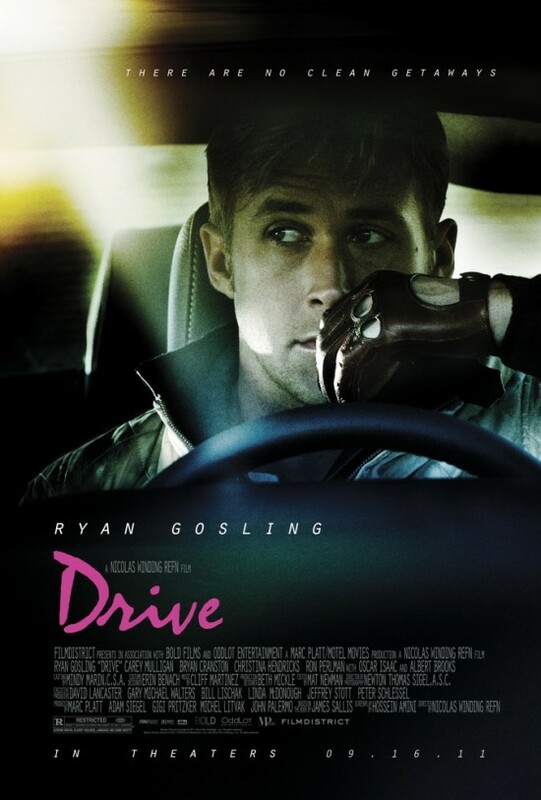 Drive is easily Michael Mann's best film in a decade or more. It may just be me, but I'm seeing something of a resemblance here. I accepted the neon graffiti font of the Drive title as due homage. The whole thing is on YouTube. Here's part one and it looks like the poster put all of the pieces up. > The whole thing is on YouTube. Here's part one and it looks like the poster put all of the pieces up. That's the same link in the OP, and there are no additional parts added as of yet. The thing I've always liked about Mann films is that the characters he staffs them with feel like people who have been doing their particular job (on either side of the law) day in and out for 20 years. Granted, he tends to focus on the police and thieves specifically. but then you watch a film like The Insider and it's there as well, in a movie without a single action sequence or a cops & robbers storyline. I was listening to an interview with Lowell Bergman, and was appreciating how well I felt like Al Pacino and Michael Mann captured him in that role. I've seen it a few times but this is movie that I'd love to see in a theater with a good sound system. I watched it in its entirety on youtube not more than two months ago. It was mentioned in an ask, I think. Kind of a funny turn the thread's taken, given the subject. Gave me a chuckle, anyway. >It may just be me, but I'm seeing something of a resemblance here. The opening reminded me of Bladerunner and the Bradbury Building. This is a fantastic film and one of Mann's finest achievements. The screen crackles with intensity with this one. Rumor has it that The Criterion Collection is prepping this for release. Drive is not a Mann film, and those fonts were popular in the late '70s through the mid '80s. Obviously there is a fair amount of similarity between the films, but if you watch Refn earlier films then you can see how he's been working with his own themes for a number of years, and that it's not a remake of Thief. I just looked it up on Netflix. Thief is available on dvd, and it says "streaming soon." I'd completely forgotten about this until now, but a friend of mine from university, who is now a screenwriter, was obsessed with Tuesday Weld's 60s film roles and set out, in the mid-1990s, to find her and see what she was up to/where she was at, her having been absent from films for a good while (though if memory serves she was actually in Falling Down, which was made in 1993). After an almost endless series of phone calls to various LA agents, talent agencies, and the like, this culminated in a trip to New York, and a long, laborious attempt to visit every diner in the East Village, and on the Lower East Side, in hopes of tracking her down. He wrote about it for the student paper when I was writing for them, and I'd like to say that he succeeded, but I'm not sure if that's fact or my sketchy memory playing tricks on me. If it was only based on the game from Looking Glass Studios, the Ebert-Video Gamer war wouldn't be happening today. Amusingly, it appears to be streaming on Comcast Ondemand. Thief is supposedly based on a book by the "mythical" Frank Hoheimer who was once considered a prime suspect in the murder of Valerie Percy, a huge case in the Chicago area back in the mid '60s. I read the book back in the early eighties when the movie first came out. The word is that Hoheimer was a technical advisor on the film under an assumed name since he was the subject of a number of federal investigations at the time. Also, John Santucci who played Urizzi, the cop relentlessly pursuing Frank (Caan), was a recently paroled thief who also gave technical advice and supplied some of the tools used on the film. Balancing out this thief playing a cop was Dennis Farina a Chicago cop who in his first movie role, played Carl, one of the thieves. Saw this recently on Netflix. Great movie and showcases Mann's talent for this type of genre piece. And yeah, could not agree more with the comparison to Drive. Also showcases Mann's talent for staging diner scenes. Check out Mann's new series Luck. I just heard it's been cancelled. those fonts were popular in the late '70s through the mid '80s. And still are... The Drive font is the same font that California currently uses for their license plates. And I've said as much before, homage or not that specific font and color has an iconic relationship with LA.